Water utility prices are rising at an alarming rate, and by 2022, it’s estimated nearly one-third of American households will be unable to afford their monthly water bill. Since 2010, water prices for a family of four have climbed by nearly 57 percent, rising at more than three times the rate of inflation. With a growing number of Americans at risk of not being able to afford water in their homes, we have a serious problem on our hands that needs immediate attention. In 2010, the average monthly bill for a family of four using 150 gallons per person, per day was $71.53. Today, the monthly bill for that same family has ballooned to $112.04, according to data from CircleofBlue.org. 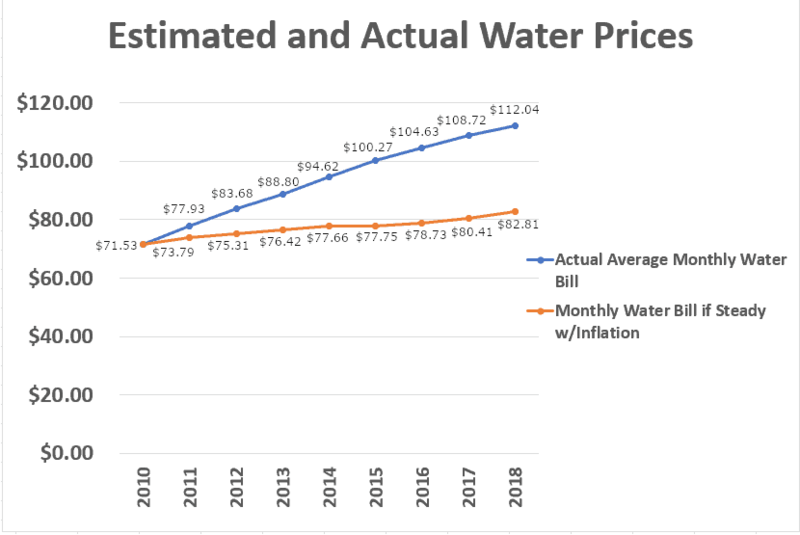 If water prices had risen at the rate of inflation over the last 8 years, that average bill would be nearly $30 a month less at $82.81. Unfortunately, prices are expected to continue to rise significantly over the next five years due to a variety of factors, including infrastructure upgrades, climate change, and sanitation. There are a number of factors that are causing water utility prices to skyrocket. First, there’s the need to replace old infrastructure in cities across the country. To replace the aging infrastructure of worn-down water systems built back in the World War II days, experts estimate it will cost over $1 trillion. This alone could cause water bills to triple. But that’s not the only challenge the country faces. 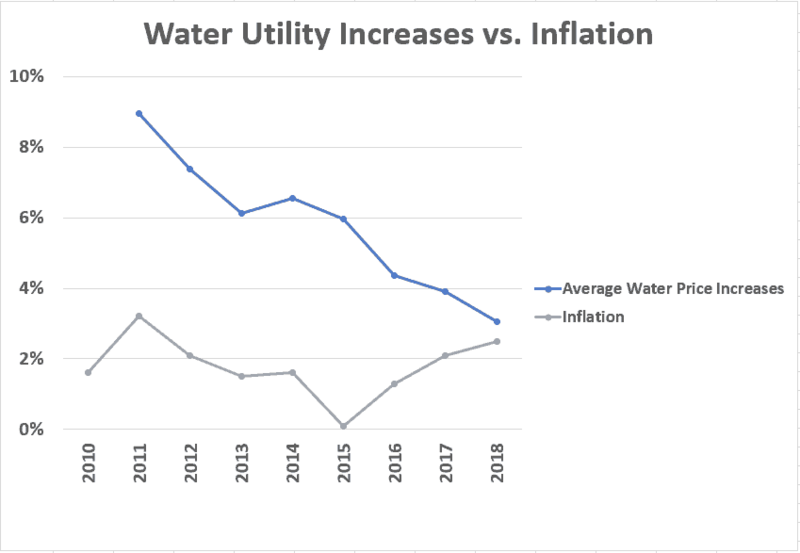 While expenses for maintaining water systems are adding up, many areas are struggling to foot the bill as water use among customers has dropped in some areas in an effort to conserve and federal funding for improving water infrastructure has also plummeted. In the 1970s, federal funding for water infrastructure was over 60 percent — today it’s less than 10 percent. Furthermore, population increases are putting more strain on water resources. In a 2014 report, 40 states stated they expect to face water shortages unrelated to drought over the next 10 years. The nation is facing necessary expenses to sustain its ability to provide water to its citizens, and most people say they are willing to pay more if it means ensuring access to safe water resources. However, being willing to pay and being able to pay a higher water bill are two totally different things that seem poised to conflict with one another. If changes aren’t made to improve the US water service infrastructure to accommodate the needs that will arise from climate change, low-income communities will be hit the hardest, leaving the poor without clean, affordable water. To make matters worse, there aren’t currently any federal laws that ensure low-income households are able to afford water services. There’s also no national funding to provide assistance in paying for water services, and in many cases, utilities and states are able to disconnect water services to those who can’t pay their bills. It can’t be overstated just how vital water is in our lives. We use it for drinking, hygiene, cooking, and a host of other essential purposes. According to the World Health Organization (WHO), 3.4 million people, mostly children, die every year from water-related diseases, due to lack of access to clean drinking water. But if prices continue to rise the way they are, over 40 million households will soon be unable to pay for water access (the EPA recommends that spending on water utilities shouldn’t exceed 4.5 percent of household income to remain affordable). That’s over one-third of all households. There are thousands of census tracts across the country where people simply don’t make enough money to cover their water bills as utility prices continue to tick upward. In Mississippi alone, it’s estimated that nearly 75 percent of the state is at risk of not being able to afford water access in the coming years. Simply put, the problem of accessing clean drinking water isn’t just something that happens in developing countries. As a growing number of Americans face greater difficulty getting safe, affordable drinking water, government leaders and utility providers need to work together to address the issue now before things get even worse. I just received my water bill yesterday and I was shocked. I am being charged 111.94 for the first time. I usually get charged about 85-88.00 per- month. I live in a small city outside of Huntsville AL. I was totally shocked. I am on disability due to MS and I don’t have the money to pay it in full.